Luxurious wheelchairs are usually higher in quality and higher in price than conventional wheelchairs. Luxury can be defined in many different ways but on a wheelchair, luxury should be defined by how efficient it is, how lightweight it is, and how stylish it is. Quality on a wheelchair can mean that the material it was crafted with is rarer and higher quality. It can also mean that the frame of the wheelchair is high quality, or that the components are better than usual. Sometimes luxury wheelchairs can be defined as such because they come with all the bells and whistles. This means that all of the available options for that model are included when you purchase it. Luxury chairs are usually categorized as higher end wheelchairs. This is because they are usually of higher quality and they also have a higher price point. High-end wheelchairs that are considered luxurious are usually custom made for the individual or they are more comfortable and durable than conventional chairs. Wheelchairs that are luxurious usually come with all the bells and whistles available. Bells and whistles refers to the maximum number or a high number of optional components that come with the chair when you purchase it. Bells and whistles can also refer to the standard components that they wheelchair may come standard with. This includes flip back or removable armrests, removable footrests or elevating leg rests can also be defined as bells and whistles. This can also include aftermarket parts that come standard with the chair, such as spinergy rims and tires, flog leg shock absorbers, and after market cushions. Luxury wheelchairs are high quality wheelchairs that are made with the best materials possible and the best components possible. Quality can also refer to the material that the components are made from, such as polyurethane. High quality wheelchairs can also be defined as such because of raving user reviews. Some quality wheelchairs can be luxurious based on the reviews that previous customers have left on the product. 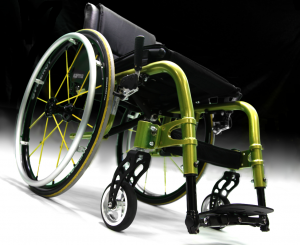 Higher quality wheelchairs are made from better material, the highest end material being carbon fiber. Carbon fiber can be the most expensive type of material used on a wheelchair. If a wheelchair has a frame that is made out of carbon fiber, more than likely you are looking at a higher quality product and a higher price point. Aircraft air grade aluminum can also be used on some quality wheelchairs such as our ergonomic wheelchairs. This material is synonymous with the aircraft industry and for that reason have a higher reputation when it comes to the wheelchair industry. Luxury wheelchairs are usually very light in weight nowadays. The same thing could not be said ten years ago when it comes to wheelchairs. This is because over the last ten years weight has become an important factor when purchasing a chair. The norm in the wheelchair industry is that if it is a high quality wheelchair it should also weigh much less than conventional chairs.